Erik Frederick, executive director of Connect Michigan, presents Ceci Marlow of the Cromaine District Library and chair of the Livingston County Broadband Committee, with a certificate recognizing Livingston County’s connected certification. 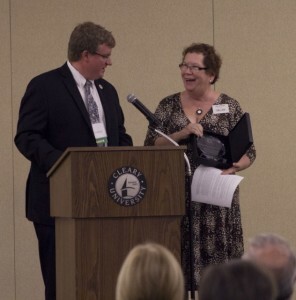 The Livingston County Broadband Committee, an initiative of Advantage Livingston’s Placemaking Committee, was honored its work in promoting Internet access at a Sept. 19 luncheon at Cleary University. The work of the Livingston County Broadband Committee under the Advantage Livingston Placemaking Initiative earned Livingston County recognition as a Certified Connected Community. This certification means that Livingston County scored well in areas dealing with broadband access, adoption and use. Accepting the award was Ceci Marlow, director of the Cromaine District Library in Hartland and chairperson of the Livingston County Broadband Committee. The Livingston County Technology Action Plan, prepared by Connect Michigan and the Livingston County Broadband Committee, was distributed at the luncheon. Click here to view the plan. While great strides have been made, there is more work to be done, work that will include some “sacrifice” on the part of the community, according to Marlow in a story in the Sept. 23 Livingston County Daily Press & Argus.